Visit our website http://www.tjaysbeads.co.uk and save 10% when you order £15 or more. Enter GB10 at checkout. We are quite excited to now be on Etsy. We noticed some stunningly beautiful jewellery pieces on Etsy which pushed us to open a store with all of our jewellery making items. 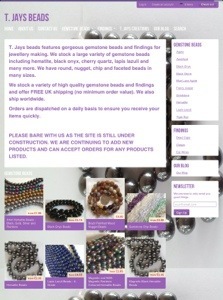 Our store name is T. Jays Beads and we have gemstone beads and jewellery making findings available. Standard shipping is available in the UK and worldwide, with express delivery available on request at an additional cost. Please bare with us as we are still adding all of our items 🙂 You can visit our store here.